in the arts and crafts. Dermatitis, narcosis (dizziness, light- headedness, fatigue, nausea, lack of coordination and headaches), eye irritation, adverse reproductive hazards including increased risk of miscarriage, and serious neurological problems can all result from the processes of screen printing. Traditionally, silk screen printing has been performed using organic solvent- based materials. Water-based inks containing less hazardous ingredients provide a safer and increasingly popular alternative. The major hazard in silk screen printing comes from exposure to the solvents in the inks, thinners, clean-up materials, etc. Thinners such as lacquer thinner and are a mixture of these and other hazardous solvents. The greatest hazard is exposure through inhalation, causing narcosis (dizziness, headache, nausea and light-headedness) from acute exposures, and skin, liver, kidney, reproductive and nervous system damage with repeated exposure. Skin absorption can also produce these effects. It is also important to note that most of these solvents are flammable. An industrial hygiene study of a university silk screen printing class verified that silk screen printing without adequate ventilation can be extremely hazardous. This study measured the breathing zone exposure of students and teaching assistants during printing using poster inks, and cleaning using toluene, xylene, mineral spirits, and lacquer thinners. Without ventilation, measured air concentrations during printing were 100 parts per million (ppm) of toluene for 100 minutes, 600 ppm of toluene and 92 ppm of xylene for 421 minutes, and 410 ppm of toluene for 60 minutes. During cleaning, the following measurements were made: 670 ppm of toluene for 28 minutes; 490 ppm of toluene and 250 ppm of methyl ethyl ketone for 8 minutes; and 1900 ppm of toluene, 95 ppm of xylene and 180 ppm of methyl ethyl ketone for 34 minutes. With local exhaust ventilation, the exposure levels were many times lower with most measured concentrations below 1 ppm, and all below 50 ppm. By way of comparison, the American Conference of Governmental Industrial Hygienists (ACGIH) has set Threshold Limit Values (TLVs) of 100 ppm averaged over an 8-hour day for toluene and xylene, and 200 ppm for methyl ethyl ketone. The ACGIH 15-minute TLVs are 150 ppm for toluene and xylene, and 300 ppm for methyl ethyl ketone. As you can see, the air sampling carried out greatly exceeds these ACGIH recommended exposure levels. The hazards associated with screen preparation depend on the materials used. For resist and blockout stencils we recommend water-soluble glues, liquid wax and liquid frisket which contain no toxic solvents nor require them for clean-up. They may cause slight eye irritation if they splash in the eyes. Lacquers, polyurethane varnishes, tusche, shellac and caustic resist enamels are often used but contain large amounts of toxic solvents. Turpentine, used to thin tusche, may cause skin or respiratory allergies, and kidney damage. For film stencils, water-soluble emulsion films are recommended. The mixture of water and isopropyl alcohol adheres the stencil to the screen, and while flammable, is only slightly toxic. The adhering fluid for lacquer-type emulsions contains acetates, ketones and alcohols, which are irritating to the skin and are more toxic by inhalation. The safest type of photostencils are diazo photoemulsions. They are eye irritants by direct contact, but are otherwise not very toxic. Ammonium dichromate, often used to sensitize photoemulsions, can cause skin ulcers and allergies with direct contact and inhalation of the powder can cause severe respirat- ory irritation, ulceration of the nasal septum, and respiratory allergies. Ammonium dichromate is also combustible. Silver nitrate, another sensitizer, is corrosive to the skin and eyes. Carbon arcs, sometimes used to expose photoemulsions, are highly hazardous, giving off metal fumes, ozone and nitrogen dioxide, which are strong lung irritants, and ultraviolet radiation which harms the eye; carbon arcs are not recommended. Printing and Drying Many silk screen inks contain up to 50 percent hazardous organic solvents. Poster inks can contain toluene and xylene, which are highly toxic aromatic hydrocarbons, and large amounts of mineral spirits. Other inks, e.g. vinyl inks, can contain large amounts of other highly toxic solvents, for example, isophorone. The bases, thinners, retarders, etc. used with these inks also contain similarly hazardous solvents. Direct exposure to the solvent vapors from the ink is a serious problem during printing due to the close proximity of the printer. Inhalation of the hazardous solvents during drying, however, is the major source of exposure since large volumes of solvent evaporate into the air in a short period of time. Curing fabric inks by heating may release fumes which are irritating to the respiratory system. Clean-up Clean-up is probably the most hazardous step in silk screen printing because of the widespread use of highly toxic screen washes and the practice of tossing solvent-soaked rags in open wastepaper cans. This causes the evaporation of large amounts of highly toxic vapors. To reduce exposure to toxic vapors during clean-up, substitute mineral spirits (or mineral spirits with 15% added xylene for difficult jobs) for lacquer thinner, toluene, xylene and other highly toxic solvents. These solvents are also fire hazards. Precautions Proper safety is essential when working with all these toxic substances. The elderly, people with chronic diseases, pregnant women, and children are at especially high risk and should avoid screen printing if possible. Consult your physician if you suffer from heart trouble or a breathing ailment which can be aggravated by toxic vapors. The following precautions will help reduce the dangers in the processes of screen printing. Fire Precautions Solvents should be stored in approved, capped flammable storage cabinets. Only a small amount of solvents should be out for use and solvents should be purchased in the smallest quantities practical in order to minimize fire hazards. Before starting work, all sources of ignition should be eliminated. See the CSA checklist on storage and use of flammable and combustible liquids. Ventilation One of the most important precautions in silk screen printing is proper ventilation. 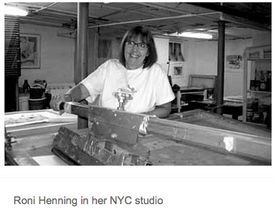 Research conducted by the Harvard University School of Public Health in a university silk screen printing classroom, showed that printing without adequate ventilation causes exposure to very hazardous levels of the solvents used. All processes producing solvent vapors -- including printing, drying and screen washing -- should be done with local exhaust ventilation. During the printing process, the best type of ventilation would be an explosion-proof slot exhaust hood located at the rear of each printing station. The drying rack should be enclosed on the back, sides, and top, and the solvent vapors exhausted from the rear. For example, an explosion-proof window exhaust fan can ventilate the drying racks, if the enclosed rack is placed right in front of the window. Clean-up can be done at the printing table utilizing the local exhaust slot hood. Bleach cleaning of the photoemulsion screens also needs local exhaust ventilation because of the chlorine gas produced. Air conditioners do not adequately ventilate screening processes because they recirculate air rather than exhausting it. (Even when air conditioners are set on "exhaust" they recirculate about 95 per cent of the air). Likewise, open windows or doors are not adequate ventilation for solvent-based silk screen printing. A National Institute of Occupational Safety and Health (NIOSH)-approved respirator with organic vapor cartridges can help minimize exposure to screen printing solvent vapors if ventilation is not adequate. Sources for respirators and rules for selection and use of respirators are included in the Center for Safety in the Arts (CSA) data sheet on Respirators (see CSA Publications List). Eye Protection To prevent eye irritation caused by splashes, wear lightweight plastic splash goggles while pouring or working with paint removers. Choose goggles which are approved by the American National Standards Institute (stamped with a "Z87"). These can be found in most chemistry supply houses and safety equipment stores and some hardware stores. If ink or other hazardous material is splashed in the eyes, flood the eyes with water for at least 15 minutes and call a physician. A source of clean water (e.g. eyewash fountain) should be accessible for this purpose. Hand Protection Gloves should be worn during all screen printing processes to protect the skin from hazardous pigments, solvents and other chemicals. Ordinary rubber dishwashing gloves or surgical gloves will not provide adequate protection. All gloves do not provide protection against the same materials. When using inks, gloves that protect against aromatic solvents and petroleum distillates should be used. Lacquer use requires wearing gloves that protect against ketones and alcohols besides aromatics and petroleum distillates. You should find out the type of solvents in the products you use by consulting the specific MSDSs. (For further information on gloves, consult the CSA "Glove Selection" data sheet). To further decrease the risk of skin contact wear long pants, a long sleeved shirt and an apron. Disposal Solvent-soaked rags should be stored in approved oily waste cans which are emptied daily. Disposal should be done in accordance with local city and fire regulations, and an approved waste-disposal firm may be necessary for large quantities of solvent waste. Never pour solvents down the drain. Small quantities of solvents can be evaporated under a fume hood or outdoors. Because of the extremely high cost of providing adequate local exhaust ventilation systems in classroom situations, there has been a switch to water-based screen printing products. In recent years the quality of these inks has improved remarkably, and many professional artists as well as printing studios have switched to water-based products. Flat, opaque, hard-edged traditional looking prints are still possible, and dye-like transparencies and washes rivaling watercolor and lithography can also be produced. The same wide variety of stencils can be used with this medium as with the solvent-based inks. The changing over to water-based inks means the incorporation of a whole new system and requires understanding of this new medium. It is necessary to take time and learn how to produce successful images. After learning how to work with water-based products, artists and instructors report that the colors are beautiful, the inks don't dry on the screen, and paper designed specifically for water-based screen stays flat. In addition the overall cost of printing with water-based silk screen inks is cheaper than with solvent-based inks because water is used for cleanup rather than the more expensive solvents. Hazards The inks and cleaning materials employed in water-based screen printing use water instead of toxic organic solvents. Airborne organic vapors, skin absorption of organic solvents and the risk of fire are greatly reduced. Small amounts of organic solvents may be used in water-based screen printing inks. We recommend products with only water, propylene glycol or ethylene glycol. Glycol ethers such as cellosolve are much more hazardous since they can cause anemia, kidney damage, and adverse reproductive effects such as miscarriages, birth defects, testicular atrophy and sterility. It is necessary to get material safety data sheets (MSDSs) on all products in order to ascertain the ink composition, since the ingredients are not always listed on the label. Use of diazo photoemulsions can completely eliminate the need for solvents. If lacquer stencils are used, then the hazards discussed earlier for solvents will apply, although to a lesser extent since smaller amounts of solvents are used. Precautions Basic personal hygiene is a must for all those working with art materials. Water-based screen printing is no exception. There should be no eating, drinking, smoking or make-up application in the studio or while working. Hazardous pigments and some toxic solvents are still used in the manufacture of water-based inks and related materials. To avoid ingestion and absorption of these substances through skin contact, wearing gloves is recommended while working in this medium. For water- based printing, a window exhaust fan should provide adequate ventilation and costs much less than a slot exhaust hoods or other complicated ventilation systems. If lacquer stencils are used, then one explosion-proof slot exhaust hood would be needed for this process. Babin, A. and Rossol, M: "Glove Selection". Center for Safety in the Arts, New York (1988). Clark N, Cutter T, and McGrane J: Ventilation. Nick Lyons Books New York (1984). 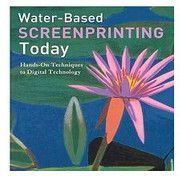 Johnson LM and Stinnett H: Water-based Inks: A Screenprinting Manual for Studio and Classroom. Philadelphia Colleges of the Arts Printmaking Workshop (1987). McCann M: Artist Beware: The Hazards and Precautions in Working with Art and Craft Materials. Watson-Guptill, New York (1979). McCann M: "Silk Screen Printing Hazards." Art Hazards News 2:7 (1979). McCann, M: "Respirators". Center for Safety in the Arts, 1988. Written and telephoned inquiries about health hazards in the arts will be answered by the Art Hazards Information Center of the Center for Safety in the Arts (formerly the Center for Occupational Hazards). Permission to reprint this data sheet may be requested in writing from the Center.